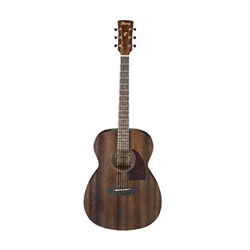 With PF Performance guitars, you get professional features, quality, and great sound at extremely inexpensive prices backed by the Ibanez name and quality.The entire body of the Ibanez PC12MH Grand Concert acoustic guitar is crafted from mahogany to produce a nice warm acoustic sound, while a tortoiseshell pickguard and rosette adorn the top to cater to the simple, yet elegant aesthetics of the PC12MH. The neck is carved from mahogany and topped off with a 20 fret rosewood fingerboard and dot inlays. On the other end of the Ibanez PC12MH lays a rosewood bridge that employs Ibanez Advantage bridge pins. The package is completed by a set of chrome open gear tuning machines with butterbean knobs.